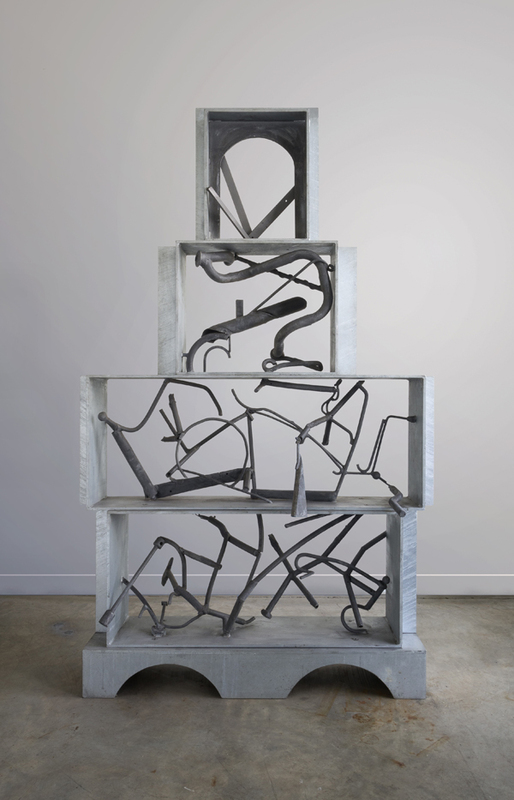 Douglas Bentham’s new Cupboards series, in rich, galvanized plate steel, is reminiscent in form to the antique handmade furniture the artist has collected over decades. Held within the vitrine-like sections is an assembly of eccentric linear drawing comprised of forgings, ancient hand tools and encrusted foundry castoffs. A mirroring effect is created as the viewer’s eye moves from section to section to the whole. As I began working on this series, I recognized the possibilities of creating bold, linear forms with a certain primitive feel, which could become containers for coloured planar inserts of a painterly nature. One quality of the sculptures that repeatedly emerged was a fullness, at once both generous and casual, that reminded me of my experiences visiting Spain, of its vivid landscape, people and culture, and of the remarkable artists whose voices we still hear. This new series, in burnished stainless steel, has developed since the completion of the commissioned sculpture for Northridge Developments. The original work was designed to incorporate a stylized image, drawn from the company’s logo, as a lintel above a gate-like opening. Douglas Bentham incorporates random scraps of metal into form and framework and skeletal structure, similar to the evolution of the human body—its bits of meteorite, mud, and water. The wonder is that, in both the human body and Bentham sculptures, unrelated pieces are intricately fitted together to work in striking unity. Bentham sculptures reveal the patterns in which these scattered elements were meant to join. These forms are their story. Although the artist plans to show the Centurions as a group eventually, the Tablets represents Bentham’s first full-fledged museum installation. These tablet-scaled works hark back to the Doors, where each work’s own materiality, its scale and flux of front/back, back/front offers a kind of psychological interior in the viewer’s imagination. The thirty-nine sculptures are to be displayed on identical plinths in staggered rows, offering viewers an opportunity to walk among them at will, in either a rectangular or diagonal orientation. The sculptures, then, take their shape around a hidden presence. Like armour, they ward off a grasping gaze. Like reliquaries, they enshrine an unseen holy thing, an unnameable beauty within. © Copyright 2019 Bentham Artworks Inc.